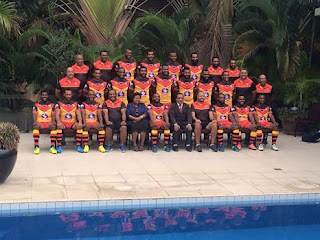 The PM's 13 match yesterday in Port Moresby kicked off with the Aussies leading by 6 points, but the PNG boys leveled that score with a try and conversion to 6 all. A penalty goal kick later put the Kumuls in front 8 points to 6. However, the Kangaroos used their class and outplayed the Kumuls and came back to lead 24 points to 8 at half time. The Second half later commenced and the Aussie boys just took off to wrap up the match with a big 48 points to 8 at full time. Despite the loss , the PNG boys sure played well to the best of their abilities. In other match of the afternoon, the first ever match between the Australian Jillaroos and the Oil Search PNG Orchids ended in favour of the Aussie girls at the National Football Stadium, Port Moresby. Final scores, Jillaroos 42, Oil Search PNG Orchids 4. For the Juniors, PNG boys outplayed the NSW Juniors 28 - 10.